This may be offering too much of a glimpse into how the sausage gets made around here, but any time you see live event coverage on Macworld.com—a keynote, an earnings call with Wall Street analysts, or some other special Apple event—it wings its way to our home page with the help of SubEthaEdit. The collaborative text editor from The Coding Monkeys lets multiple people work on the same document at the same time. For our particular setup, we can have a couple of editors furiously typing in notes at the press event itself, another editor back at the home office cleaning up the text and posting it to the Web site, and several of our overseas partners peeking in at the SubEthaEdit file and grabbing what they need—all of it going down simultaneously. So we’re as interested as any Mac user in the latest version of SubEthaEdit announced on Monday. The marquee addition to SubEthaEdit 3.5 appears to be code folding—a new feature that lets you hide text or source code in a document. Doing so should let you focus on the task at hand. You can either context-click or use keyboard shortcuts to fold a semantic block, such as an HTML head tag. A folding bar running vertically down the left side of the document window lets you select a block of code and fold it with a double-click; you can make folded code re-appear by double-clicking the placeholder or clicking the disclosure triangle. 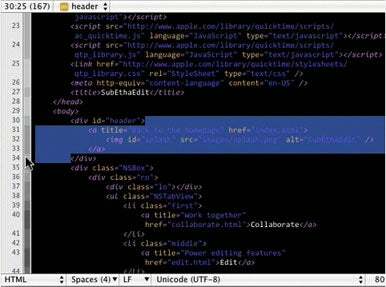 A screencast on the SubEthaEdit product page demonstrates code folding in greater detail. SubEthaEdit 3.5 also introduces document state persistence—a fancy way of saying that the application will now remember window positions, sizes, and cursor positions. URLs are now clickable if the mode has URL recognition; opening the link doesn’t interfere with editing, according to The Coding Monkeys. The update also introduces an HTML tidying feature, as well as other performance improvements and bug fixes. The provides the complete rundown. SubEthaEdit costs €29, with volume discounts available starting at three licenses. The Coding Monkeys lets you try out SubEthaEdit free for 30 days.